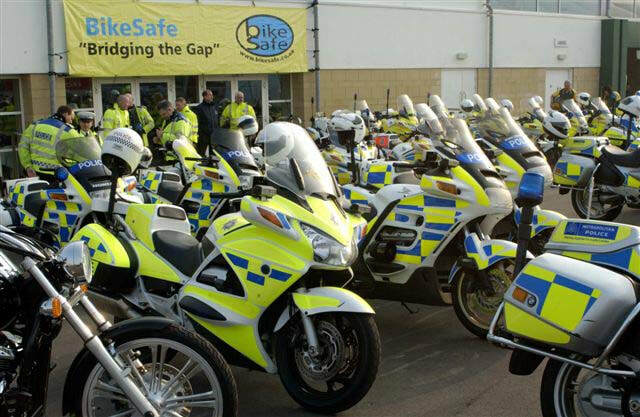 BikeSafe is a Police led motorcyclist advisory, assessment and referral scheme, with workshops that typically run throughout the spring and summer months. You can ask as many questions to the Bikesafe team, ensure you visit them today here at Brackley. The aims of BikeSafe are to encourage those attending to then go onto take advantage of accredited post-test training and to encourage positive rider behaviour and attitudes. BikeSafe workshops are scheduled throughout the UK and provide detailed briefings on hazard awareness and how to make your motorcycling safer, followed up in most forces by an on-road assessed ride. Under the eagle-eye of an experienced BikeSafe assessor, you will receive detailed feedback on the strengths and weaknesses or your riding. The crucial next step after having had your BikeSafe assessment is to go on to undertake further training from the range of organisations that provide post-test training throughout the UK. Bikesafe will also raising awareness of improving motorcycle skills, delivering a track experience and showcasing the very best of what the motorcycle industry has to offer merging with the ‘Open Roads’ events that highlights other vulnerable road users and their experiences. Various taster sessions, ride in a Police car, drive a truck, try a motorbike or car for the first time. The aim is to provide a fun day out for families, non-drivers and drivers, young and old, but the motivation for the day was also to help cut the number of people being killed or injured on Northamptonshire’s roads.